Aldebaran is the brightest star in the constellation Taurus and is known as the "Eye of Taurus." The name "Aldebaran" is Arabic, which means "The Follower" because it appears to follow the Hyades star cluster that forms the head of the bull. The K giant star is slightly larger than our sun, at 1.7 solar masses, and strong winds emanating from it are bleeding away its mass. Aldebaran is older and redder than the sun and preparing to fuse its lightweight core into heavier elements, which is common among stars of its type. Aldebaran has a surface temperature of about 6,760 F (3,738 C) and glows red, similar to Mars — which occasionally passes by the star in the night sky. Because the star's luminosity is well understood, it is sometimes used for comparative astronomy. In 2006, for example, the Cassini spacecraft gazed at Aldebaran through the rings of Saturn to learn more about ring particle concentrations. The star was noted and named in Chinese, Roman and Hindu astronomy, among other cultures. Aldebaran would have been hard to miss for the ancients, given that Taurus is very visible in the winter. The bull, in fact, is one of the oldest documented constellations. Its origins stretch back at least as far as the Bronze Age. The star is often covered (or occulted) by the moon, since it lies close to the path of the ecliptic (path of the sun, moon and planets in the sky.) Because of occultation, it is relatively easy to get a rough idea of the star's size by estimating the time it is covered, as well as observing it in different locations. Calculations show it's about 44 times the size of the sun. 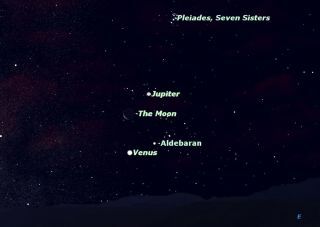 While Aldebaran appears to be part of the Hyades cluster when viewed from Earth, modern measurements show that it is actually in a different region of space altogether. Astronomers occasionally use bright stars as guideposts to increase their understanding of other objects. One example took place during the Cassini mission in 2006, when the spacecraft took a series of images of Aldebaran behind Saturn's rings. "This type of observation is known as a stellar occultation and uses a star whose brightness is well known," NASA stated at the time. "As Cassini watches the rings pass in front, the star's light fluctuates, providing information about the concentrations of ring particles within the various radial features in the rings." Another past project used Aldebaran to map the moon. "Accurately timed home video camera recordings from different locations can be used to make improved maps of the height of the lunar terrain at these occultation points," stated NASA's Astronomy Picture of the Day website in 1997.